Received Renee Bevan’s brooch @ the swap meet. It’s the exact opposite to Kristin’s brooch and much easier to wear and attach. Having a generous breast shelf on which to perch it helps! It’s a brooch that attracts a lot of attention. It’s hard not to notice it. Wore it to R’s 60th birthday. People seem to see it from a distance and then come up for a closer inspection. Some want to touch it, other tried smelling it! I like wearing it, but I have to be feeling confident and outgoing – several people have wanted to buy one! I’ve sent them along to Masterworks. Decided to wear the brooch to Newmarket, and went to various fashion shops – ie Zambesi, Karen Walker, Kate Sylvester etc. although peoples’ eyes swiveled towards the brooch, not ONE comment. Disappointing! Went into John Howells, the jeweller in Mount Eden. Asked him what he thought – He commented on its crafting – (good). Thought it was a fresh interesting, concept. It has been fun wearing Renee’s brooch, it’s easy to wear. The pin is very good, and it’s light, and nestles nicely on my chest. My only reservation would be the backing material is it felt? It’s not the colour I object too, but I felt a lovely, soft leather, like chamois would probably wear well, and give it a different feel. Not one person said they didn’t like it. Some said they wouldn’t wear it. Well I wore mine brooch to the vegetable shop after the launch where I got no looks..Grey Lynn..so they are so use to anything and everything! I wore it the next day, Monday 13th March to work. In the afternoon I went to a special meeting convened by CNZ at the Maritime Museum. I purposely bused downtown and walked to the meeting and noticed a few people surreptiously glancing but received no comments or direct stares. At the meeting…a slightly tense affair..the broach was a good ice breaker, as Dan has similarly reported. Someone, in fact a rather prominent woman, said she really liked it and she certainly has the chutzpah to wear it. Another person heard me explaining about it and said something like …’no dear boy you are wrong, it isn’t a rose, it is a peony’. Well I didn’t want to argue…But I’m sure it is a rose! yes, I do think it is a rose. An old fashioned, filled one, possibly something along the line of Reine des Violettes. I have one in my garden! Rene, what is the verdict? Ahhh yes, the solitude of my studio (and the silence here) Raewyn, Lynsay, I totally agree, this project is a wonderful chance for valuable feed back from both wearers and makers and anyone really who follows this. 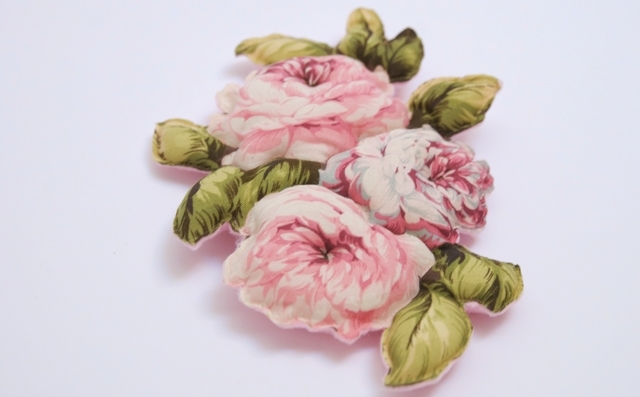 So lets get some brooches talking, pleeease…. I found the broach exciting and challenging – but unfortunately not one I could wear to my Art Room as I was worried about it getting grubbier than it already is and I found that when I did wear it people seemed happy to touch it and squeeze it – which I actually found surprising. A Sharon Fitness work seems to encourage people to touch it becasue the material used is unusual – but quilted fabric? Perhaps it is the fact that it is padded and people want to know how soft it is?? I also found that I felt mcuh shorter when wearing the broach as it was much bigger on than it looks. Not a broach one could wear if not wanting attention that’s for sure. It was pleasing to see the explosion of BOM wearers and makers at the Objectspace “Best in Show” last night. A good turn out and some great new work to view from some very talented young(?) people. Makes me wonder whether I took the right direction (career-wise) but I guess there’s still time and opportunity to take a different pathway in life ….and I gather from makers that the living to be made from making objects is of a level that would not fund my collecting habits so I’ll probably stick with my current day job for a bit. Kristin and Raewyn put on a very good show with their window installation of jewellery – some of which I could link to its maker, while some I had to resort to the handy folder of info and be introduced to new people and their work. I did the big pink flowers on big pink flowers thing again (so Renee, you were on show at the “Best in Show”) to try it out with a wider audience. Needless to say there were plenty of comments and looks – Kristin has a photo somewhere as evidence …. I think it’s such a cheerful brooch people can’t help but comment. I have often wondered what it would be like to wear one of Renee’s big brooches. Now I know – it’s fabulous! Thanks Renee for the opportunity. I have to admit that roses are not my favourite flower and yet the fact that this brooch transforms the rose hasn’t mattered. I have enjoyed wearing it immensely and have found that my mood lifted each time I put it on. This brooch is big and glorious and makes such a dramatic statement. It is another one of those brooches that has been so easy to wear- extremely light so it can be worn on all fabrics and somehow, despite its size, it seems suitable for all occasions. This brooch has been out and about a great deal over the past month and has attracted much attention. Received many positive comments and absolutely no negative ones. People were fascinated by it; by the idea, by the nature of the material and by its construction. It was a brooch that people very definitely wanted to touch….think many people could not quite believe what they saw and this brooch certainly took their fancy. Had a few people who wanted to know where they could get one for themselves and I think there might well be some intentions of imitation out there in non-jewellery land. All viewers thought that it was very different from what they expected of a brooch but loved it and thought that it was very clever. This brooch reminds me of long-ago art days at school attempting to create things out of bits of fabric and of the frustration that came with the end result never being what was envisaged. It reminds me of skills I don’t possess like those associated with applique, patchwork and tivaevae. I think it is very clever to select a bloom from a piece of fabric and by highlighting it transform it into something that can be worn with pride. Friends who can sew seemed especially taken with this brooch so I’m looking forward to seeing what they think of Rachel’s brooch which I get to wear next. I find that there are people in places where I go regularly who now look to see what new offering I am wearing so think it will be rather sad when our year as brooch-wearers is over. Maybe that will give me an excuse to purchase some new pieces…one a month? It has been so much fun to wear these very different brooches and I have found it fascinating how my initial perceptions of some of them changed over the time I wore them. The year has passed much too quickly. Thanks for the fantastic opportunity.